A culture of hate at San Jose State? 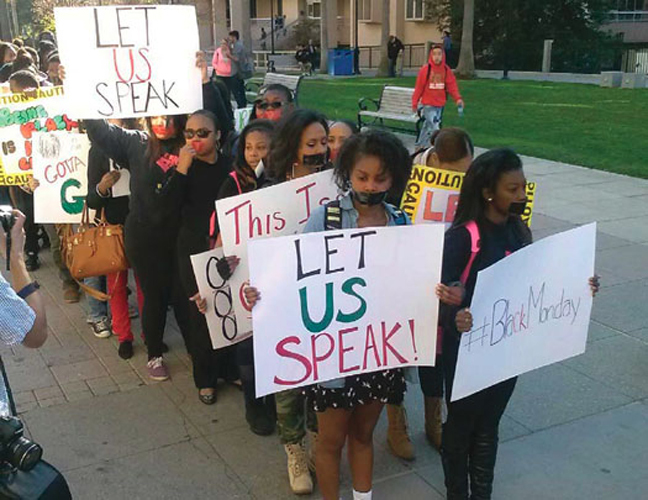 SAN JOSE, Calif. (FinalCall.com) — A diverse coalition of student organizations held a silent march and protest over alleged racist bullying of a Black 17-year-old San Jose State University student by his four White dorm mates. The students also accused the university of a cover up to protect its image and fundraising, and said officials simply don’t care about Black life at San Jose State. “They wanted to keep it on the low. Just hush it up and move it to a different dorm,” Gary Daniels, a spokesperson for In Solidarity, told The Final Call. Students are demanding a thriving African American Studies Department, an African American Student Success Center, and zero tolerance for racial hatred and symbols. They also want a letter from the associated student’s president and the university provost in support of their suggestions and a commitment to improving the well-being of Black students at San Jose State. Mohamed Qayoumi, university president, admitted failing students and promised administrators would listen more. Residence hall advisors will also receive more training, he said. From August through October, Logan Beaschler, 18, Colin Warren, 18, Joseph Bomgardner, 19, and an unnamed White student who is a minor, allegedly abused a 17-year-old in their shared four bedroom dormitory suite. According to the district attorney, they nicknamed the Black victim “Three-Fifths,” referring to the vicious period in America’s history when Blacks were counted as three-fifths of a human being. They called him “Fraction,” decorated the suite with Nazi symbols, photographs of Adolf Hitler and wrote a racial epithet on a white board, prosecutors said. They also tried to clamp a bicycle lock around the victim’s neck but he fought back, according to the district attorney. Each has been charged with a misdemeanor hate crime and battery, and if convicted could serve one year maximum in county jail. The district attorney has said the charges reflect their criminal conduct, not the degree of their racism. But how could the DA separate racist hate from the crime given the circumstances? student protestors asked Nov. 25. “These boys are on a suspension right now and their punishment in housing is to get moved to another room in a different dorm. Why? Probably to terrorize another student,” Mr. Daniels told The Final Call. Residence assistants are kicked out and lose $14,000 worth of housing if drunk, and students are kicked out of housing if they smoke marijuana, get caught drinking too much or have too many minor infractions, he noted. “But these kids tortured this child, this young man for three months and the university knew about this,” Mr. Daniels said. The NAACP has called for filing of felony hate crime charges. But there was also some friction between the NAACP and students, according to the protest leader. Mr. Daniels told The Final Call students were supposed to hold a joint press conference with the San Jose/Silicon Valley chapter of the NAACP Nov. 25 but students were shut out. The NAACP drafted a plan to move forward with the university, he said. “It makes no sense how you can have a meeting about students and not have students in the room?” Mr. Daniels asked. Students asked to speak at the press conference, but were denied, said the protest spokesperson. Students, with red and black masking tape across their mouths, had marched past the dorms to the press conference at the famous Tommie Smith-John Carlos 1968 Olympic Black Power protest statue. The two young athletes offered an unforgettable Black Power fist salute on the podium after winning medals. Alice Huffman, NAACP California president, directed the sound engineer to turn the mics on and then introduced Mr. Daniels, according to the student leader. Final Call phone and e-mail requests to the NAACP for interviews about the student allegations and concerns, as well as the hate crime, went unanswered. “With this issue in particular, it’s just outrageous because we’ve been trying to let the university know that things were wrong. … Now it’s a crisis. Now it’s like a national hate crime and now they care, even though we were telling them this last semester,” said Mr. Daniels. Research by the Black Student coalition revealed the situation was a lot worse than they thought, he added. Black students had a graduation rate of less than 40 percent, he said. Students said they didn’t realize things were that bad. But Denise Johnson felt things were horrible. She told The Final Call her son Gregory Johnson, Jr. was murdered at the Sigma Chi fraternity house on the campus five years ago. No one’s been held accountable, she said. The university and a coroner ruled the death a suicide. They said her 6-foot-2, 220 pound 20-year-old son hung himself with a cord affixed to a ceiling water pipe, but she’s 5-feet-6 and could touch the pipe, Mrs. Johnson said. The problem is San Jose State’s cancerous atmosphere of silence, she said. “We really haven’t raised our children to deal with this kind of thing. I know I didn’t. … That’s not a place for higher education that’s a battlefield and it could cost them their lives. Not knowing could cost them their lives!” said Mrs. Johnson.